I just wanted to share with you the new unexplainable things that have happened lately, concerning all within my household. 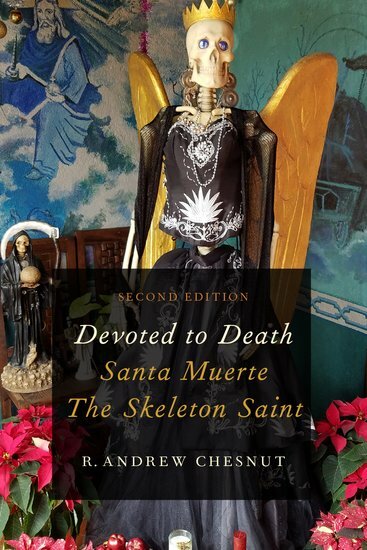 I have for a couple of years been interested in Santa Muerte and was fascinated with the book “Devoted to Death” by Andrew Chesnut. For once I found something that seemed to resonate within me and looking at the skeleton figure I felt peace and connection. Coming from an active reborn Christian family, I was in the closet with my fascination and dedication with the skeleton saint. Slowly I found myself connecting stronger and stronger and missed not communicating with her. Slowly my faith in the Christian movement bored me and felt no connection, so after asking God for permission to invoke the boney lady (Sorry Andrew it’s your phrase I know), I found my prayers where almost every time answered. Just one small example if I didn’t put the lottery ticket next to her statue I would lose, but next to her I would win, or get a lucky dip, never big amounts but just enough to help. Things changed, my ninety-six-year-old my grandmother was very ill in hospital and to be honest dying. Being surrounded by my family, I was again subjected to the firm pressure of reborn Christian faith. I started to feel scared and took my Santa Muerte pendant off and my face of Jesus pendant back on, I didn’t feel comfortable but had to do this for my family, they never knew and I wanted to keep it that way. When I came back from the hospital a parcel was waiting for me, I opened it, and it was a small pewter statue of the skeleton saint – I hid it away and wished I never ordered it from eBay. Nine days went on and Jesus took over, pictures were back and where my skeleton saint stood, now stood Jesus. She was now almost removed from the house and the light of Christendom had taken over. Everything started to go wrong, my nan died, which in all fairness was expected. My sister attempted to kill herself after a long couple of years fighting depression over her dead son, she survived but again more bad news; My dog had a cyst removed from his leg, the blood stopped circulating and resulted in the leg being amputated. I had enough; I kept feeling something is wrong, and my life was so good when Santa Muerte was here. I was running a bath, and the cover of my iPhone fell off and a card I put in there ages ago, fell out, I picked it up, and it was my lady saint, Santa Muerte, prayer card. I looked at the card and read the writing; it was a prayer card to banish curses and hexes from your life. That was my sign; she is back in my life, the Christian pressure has all been removed, and her statue sit’s back where she belongs. Tonight I lit the three candles, left some sweets blew a cigarette into her face, which I will admit seems so rude, but she appears to like this and left a can of coke. I said my prayers and asked the almighty God permission to invoke Santa Muerte and converse with her. I sat and quietly spoke with her in my head, and felt as though she was listening. Straight away the house feels happier and warmer, my dog which is off his food for a while has just eaten masses of ham and looks more like himself, and for the first time has walked out into the kitchen to have a drink of his water from his bowl. I feel like she is back home and back with me. I just look forward to all the negativity removed, and the bad luck that seems to have attached its self to the house shattered and gone. I just wanted to share with you, my experience as the devotion to her gets such bad press and used in the positive way she is a caring, helping, can do saint and welcomes everyone. I send all of you that read this my blessings, and I hope she helps you as much as she has helped me. Asher Meekins is a writer living in the United Kingdom. His first novel, Pascal, was recently published via Amazon Creative Services.